This week began with two posts by me, or featuring me away from Mama C: one discussing Sam’s reaction to being excluded from certain social dynamics at school, (and being the one who does the excluding), compared to my feelings of being “other” at a bridal shower at MomsofHue. The other appeared at my Open Adoption Blogger interview partner’s site; Adoption Aint for Sissies. Jill’s excellent questions allowed me to reflect on a few things that I have never taken on here in the same voice or light. Please stop by her site, read the interview, and let her know you’re there. She is an amazing woman, who I am honored to have met here. Then today I was asked to preview an upcoming article that I wrote for Adoptive Families Magazine-which looks stellar. It is due out in May. I had to call Cordell, the owner of a local black barbershop to check out that I had everyone’s names correct. He was amused to say the least about the fact that him and his colleagues were going to be in Adoptive Families Magazine. He said Sam was good for a free line up if he liked the article. In the tap of a refresh button it was confirmed that I would be a panelist at a Boys to Men Conference geared towards supporting the mothers of boys in April. I will be one of the participants on the panel exploring issues particular to raising boys of color, in a predominantly white state. Sam was in a public service commercial encouraging people to exercise that began airing this week. Then I was presented with a recording of my class that was filmed for the Great Schools Project. I have sent off all of my paperwork for the Mom Congress, and can not begin to fathom actually having something looking like an appropriate wardrobe for that, let alone all of the research and reading done that I feel the event calls for. But, this upcoming speaking engagement at the Boys to Men conference will certainly help me to feel more prepared to represent the concerns of the mothers in my state with greater accuracy. A friend called Tuesday to tell me he read a poem of mine in a packet they were given in their day long adoption education class in Boston. I am flattered that MAPS deemed it worthy of including it in their materials, although really the poem was not one of my better ones. They did cite me. It just would have been nice to be asked. Of course who knows where they saw it, and probably they had no way of finding the source. Funny to think of all the ways a poem can take on a life of it’s own. Did I mention the faculty talent show that I always read a few poems at, or parent teacher conferences, or the opening ceremonies for t-ball that are just around the corner? And which farm do we go to to celebrate Maple Syrup Sunday this week? The boys? They are amazing. I sent a text to Sam’s namesake a few nights ago that said; “the boys are both funny, delightful, and sweet with each other. We are laughing all the time. Five years later, and all the good work is paying off! Easy.” Of course I just cursed everything by even suggesting ease. I have an index card tacked up on the wall of my closet, across from my bed that says; “book author, bridge builder, speaker, conferences“. I put that there about three months ago to inspire me to aim towards my goals. It started with Moms of Hue. It continues here. 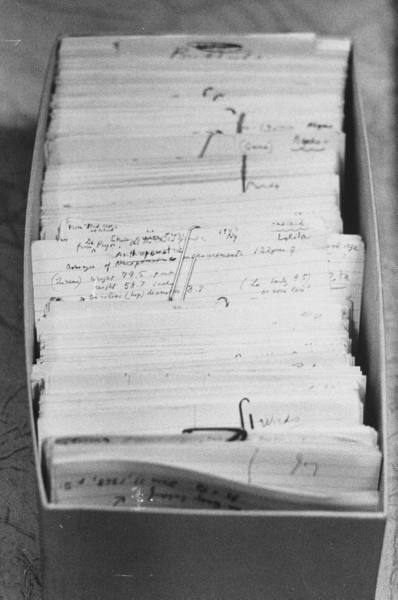 The picture above is from one of Nabakov’s manuscripts composed on index cards. I liked the idea of a lifetime worth of goals on index cards in a shoe box somewhere. What is going on your 3×5 card for you to look at before you go to bed tonight? Just remember: in three months you will be living it. Thanks for raising two Boys of color in a predominantly white state all by yourself, being and Thanks for sharing your story I am inspired.. Thank you Pious for all the work you do for young people of color in a predominantly white state! I look forward to joining forces! Thank you Thank you Mama C. I’ll be writing my 3×5 today. Can’t wait to hear about what is on that card Mama! Holy cow, Catherine!! I’m just bowled over by what you’re taking on, and the excellence of the content of your blogs. Real, authentic, words-to-ponder-and-live-by substance. From the “Adoption Ain’t for Sissies” post – “How uncomfortable I became in my own skin,” as the answer to what was BOTH the biggest unexpected hurdle and the biggest blessing of raising a child of another race. I love the clarity of these expressions, and the punch they pack – how much stuff there is to unpack and muse on. And from this post – the simplicity and power of a small vision written on a tacked-up index card, as both a metaphor and an actual exercise – wow. It’s a joy and a blessing to witness you finding your voice in so many venues and with such depth and clarity. This means a great deal coming from one of my newest cohorts, gurus, and inspirational sisters! That you took the time to read all three posts, and find the lines that exposed me the most speaks volumes too! Thanks dear friend! Such a great idea, the index cards. I have the same thing but on a big ol’ sheet of paper on my meditation altar and folded in my wallet. Thinking I might do the index cards instead. Index cards? So, thats your secret. My husband is always encouraging me to write my dreams down and I am somehow afraid I will jinx them or that the paper that I write them on will turn into some monster that glares at me from my nightstand and makes me feel inadequate. I am realizing that allowing myself to vocalize them makes them a much more tangible reality. Besides, an index card is smaller and less intimidating lol. Love this!